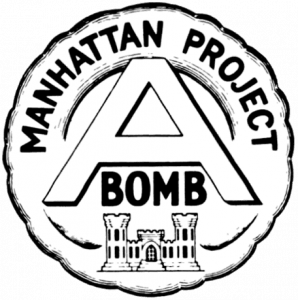 Unofficial emblem of the Manhattan project, circa 1946. (Public domain). The story of “Nuclear New York” has to start with the invention of the nuclear bomb. The story of the invention of the nuclear bomb does not begin with a single person—the contributions of many scientists led to the first atomic bomb. But one man, a New Yorker, became the face of the project: Robert Oppenheimer. Manhattan contributed more than its name to the “Manhattan Project.” The project needed Columbia scientists and New York businesses and resources to succeed.